Yup, I am posting today because I can. There have not been too many non-YOP posts lately. Not that I don't think of doing them. The day just seems to slip away after I finish dinner and before I know it, bedtime is upon us. Not today. I have been awake since 3 this morning. My feet finally hit the ground around 5. My daily chores are just about completed. I am waiting on my bedding to finish washing and drying so I can make our bed. Then my day of 'work' will be completed and I can move onto my crafting or reading. Which ever speaks to me. There also might be a nap involved in today. This is what happens when we get up way too early. 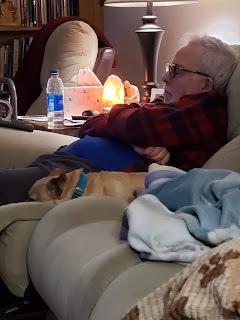 HEEHEE......hubby doesn't know I snapped that photo of him and Enrique snoozing after a very early morning. He turns on sports and then promptly falls asleep LOL. This was a morning he got up at 3 or 4. For some reason, the older we get the more often we wake up at horrible times of the morning. Tonight we are having tacos for dinner. You have heard of taco Tuesday, yes? It is a pretty common thing here in the southwest. We try and have some sort of Mexican food every Tuesday to honor the saying. I have already prepped the garnishings for the tacos so all that needs to be done is cook the meat and fry up the corn tortillas. This is hubby's favorite meal. He will be making salsa for the tacos, later on today. He makes the BEST salsa. It could take the varnish off wood! We love it hot! Our Daughter calls it 'weapon grade' salsa. On another topic.............do any of you have cup holders in your furniture? I have them on the piece of furniture I sit on. Do you know what they are really for? Yarn holders! That is some of my cotton yarn I am working with today to make dishcloths. They are the dribs and drabs left over from earlier made cloths. I love mixing and matching them together to get interesting cloths. No need to throw the leftovers away. If they don't look nice enough to give as a gift, I will use them. You can never have too many dishcloths. Time to go and make the bed. I too suffer from getting up extra early from time to time. This morning I woke at 4:40am when usual time to wake is at 6am. One good thing about it I've gotten 3 hours of knitting in already. I get up at odd hours too but I stay up as I can't get back to sleep so I just go with the flow! But I do find myself yawning mid afternoon or earlier! LOL! Great use for cup holders! Cute picture of the hub and his side kick....he looks like Wolf Blitzer the news guy! Your hub not Enrique....lol! Glad to hear from you aside from YOP. I can't eat spicy things much....I get heartburn which I never had in my life before but it happens now. We from the midwest aren't really used to spicy food...we come from the land of meatloaf and potatoes..ha! ha! Do you make your own tortillas? I've never done that...I just buy the kit with everything in it. Sounds yummy! I've heard of Taco Tuesday but in the midwest we have meatloaf Monday...lol! Wowza, you are up hella early. That's a good idea to use cup holders as yarn holders and trippy that your furniture has them. The salsa and tacos sound delicious! I wouldn't be able to take the heat though. How absolutely wonderful!! 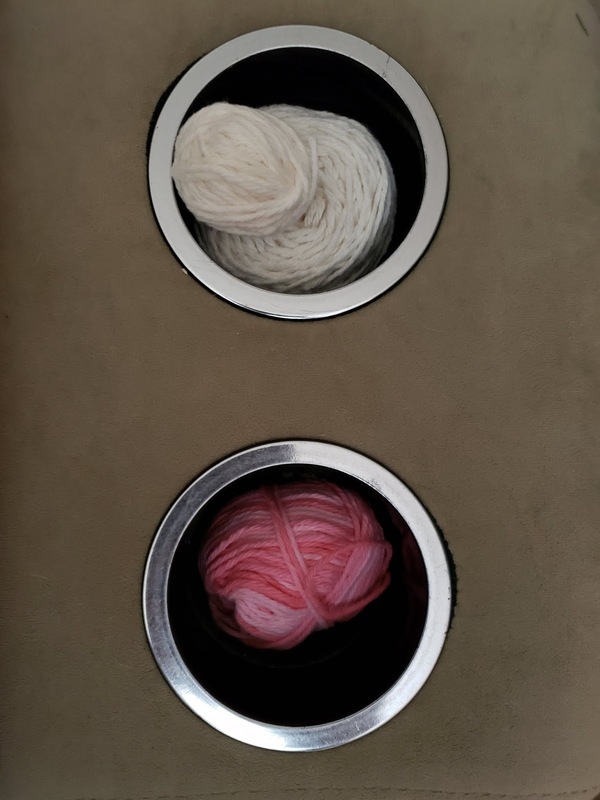 Cup holders - yarn holders! How very lovely! I totally understand the waking up early. It's only made worse when once can get to sleep at a decent hour (like me, too many times). The picture of your hubby sleeping makes me smile. He looks so completely content and restful.